Vast Aire and Cosmiq (who produced all but one track of Can Ox’s critically acclaimed sophomore album Blade of the Ronin) are collaborating together on a full length LP entitled, Aireplane, which will be the flagship release in 2018 from IGC Records. Vast Aire is in rare form on Aireplane, balancing cerebral concepts with witty and entertaining wordplay, as he and Cosmiq take fans on a journey through a series of sonic dimensions and planes of thought. Aireplane is Vast’s first solo album since his Ox 2010: A Space Odyssey release. 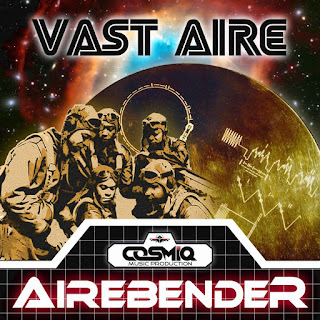 Prior to the release of the Aireplane album, Vast Aire and Cosmiq will also be releasing the Aireport EP. "The “Airebender” and “Dark Metropolis” singles are examples of some of the greatest music I’ve made to date” Vast commented to Hiphopdx. “The Aireplane album will take people through different dimensions, levels and plateaus of ideas and sound. These tracks are symbolic of the musical energy we want to introduce….each is its own unique world. The master of the elements is here!"